A bar in Las Vegas is being criticized for posting an insensitive joke on its marquee after the Super Bowl. The Blind Tiger has since apologized for the sign. ‘My heart goes out to his family and all the other ones. We apologize. It just wasn't meant to be that mean or hurtful,’ an employee said. People have taken to the web to admonish the bar, urging others to avoid the Blind Tiger at all costs. One man did more than just call. Jesse Moore saw The Blind Tiger's sign on social media and it really hit home. His 3-year-old daughter Jillian is battling a cancer that has a 50-50 chance of killing her. He went to the bar to let employees know how he felt. 'What was on that sign is just soulless,' he said. 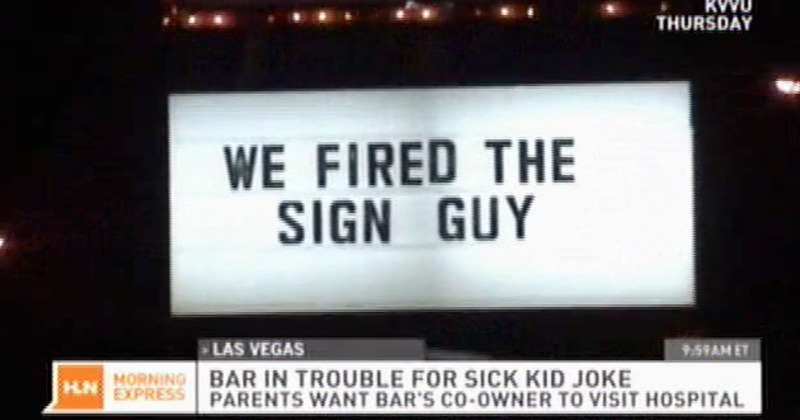 One of the bar's employees told KVVU the sign was in bad taste. 'My heart goes out to his family and all the other ones. We apologize. It just wasn't meant to be that mean or hurtful,' she said. According to KPHO, the bar has a history with St. Jude. In the past, it has done a few fundraisers for the research hospital. The bartender also mentioned to KVVU that this year marks the third year the bar has participated in a bike run benefiting the hospital.